STAR IN THE DUST. Universal, 1956. John Agar, Mamie Van Doren, Richard Boone, Leif Erickson, Colleen Gray, James Gleason, Terry Gilkyson, Harry Morgan. Based on the novel Law Man (Ballantine #51, 1953) by Lee Leighton (Wayne Overholser). Directed by Charles F. Haas. 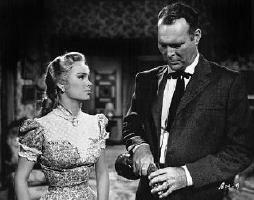 A �B� western, perhaps, but it packs a lot of drama into its 80 minutes. Folksinger Terry Gilkyson, soloing on his guitar, frames the story from time to time, the tale of a bad man named Sam Hall (Richard Boone), who is to be hanged at sundown at the end of the single day in which the this film takes place. But why is a review of a western movie here in the first place, on a website dedicated to crime and mystery fiction, you may ask. And I reply, in almost every western, whether in print or on film, there is a crime, and as a bonus, there is often a crime to be solved. The mystery in this case is, who hired Sam Hall to kill three farmers who (the ranchers say) crossed over the creek into their lands? 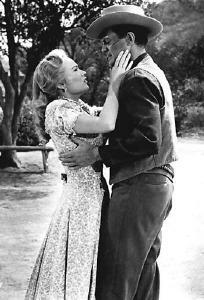 The sheriff (John Agar), who�s been staying neutral and keeping the peace, has his own battles to fight, trying to live up to his father�s reputation on the job, for one, and salvaging his wedding to the sister (Mamie Van Doren) of the banker (Leif Erikson) who�s the head of the cattleman�s association (see below). And (as fate would have it) this would-be brother-in-law is his leading suspect as well. It�s a tough job, but Sheriff Jorden seems up to it. 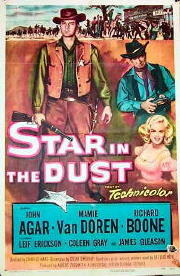 You might think that Mamie Van Doren would be out of place in a western drama, but I certainly didn�t mind. It also seems to me that throughout his career James Gleason always played skinny old men, and at the age of 74, when he made this one, he�d finally grown into the part. Richard Boone may have made a better western villain than he did a western hero (Paladin), and even if you may not agree, he�s at his best (that is to say, his nastiest) in this one. There are a few twists and turns in the tale, more than I expected, but as far as the identity of the man who hired the killer is concerned, unfortunately there is no twist at all. There�s plenty of full color action, though, for those who look for that in their westerns, including one sprawling fight between two ladies who are no ladies at the time at all, neither of whom is played by Mamie Van Doren, who is always very definitely a lady.